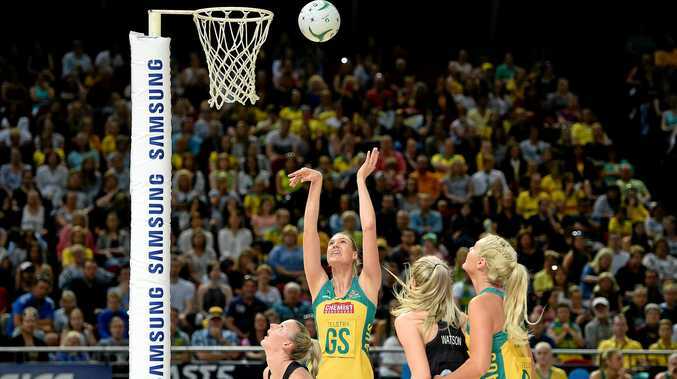 NETBALL: Led by a perfect display from shooter Caitlin Bassett, Australia equalled its highest ever score against New Zealand as it claimed a convincing 68-56 win in the first of the Constellation Cup Test matches in Sydney. Bassett set the platform for the Diamonds' win with a flawless performance in goal, notching up 47 goals from 47 attempts in her three quarters on the court. Had coach Lisa Alexander kept Bassett on for the full game, she would have undoubtedly beaten her record international tally of 53, collected in her last outing against the Silver Ferns in last month's Quad Series decider. In an opening reminiscent of last year's World Cup final played at the same venue, the visitors were blown off the court from the outset, finding themselves 9-1 down after five minutes. But unlike that World Cup finale, this time the Diamonds continued to dominate. The 193cm sharpshooter Bassett was paired with 192cm Gretel Tippett in the first half and the duo took advantage of the stark height difference over their opponents. Kiwi defenders Jane Watson and Katrina Grant could do little to stem the flow of ball into Bassett, repeatedly watching it sail over their heads as the Australian midcourt delivered passes with pinpoint accuracy into the shooting circle. The Australian defence, meanwhile, led by the tenacious Sharni Layton, proved suffocating. The series now moves to Tasmania, where the two sides will meet on Wednesday night.